Who needs virtual reality when you can witness a Sci-Fi style battle unravel in front of your very eyes? Millions of sardine soldiers synchronise their globoid defence as fighter jet dolphins dive-bomb their army. Driven to the edge of their territory, the soldiers are blocked at the border of the aeriform world, where they swirl in tighter units to stave off the onslaught. Now the army is in real trouble as their intelligent assailants are joined by winged gannets attacking from above. The sardines are surrounded from all sides and fatalities are occurring thick and fast. How long can they ward off this assault? The doomed soldiers finally succumb as a humongous tank of a humpback whale steams in from the depths and engulfs the last remaining sardines. As the predators leave the battlefield, the only evidence of the climatic event is the sardines’ sparkling scales slowly sinking towards the sediment. Each year between May and July the Sardine Run takes place along the coast of . South Africa’s Eastern Cape. Billions of sardines spawn in the cool waters of the Agulhas Bank and move northwards towards Mozambique The sheer numbers of bait fish creates a dramatic feeding frenzy with predators arriving en mass. When threatened, the sardines group together into bait balls (tightly packed spherical formations) as lone individuals are more likely to be eaten than large groups. 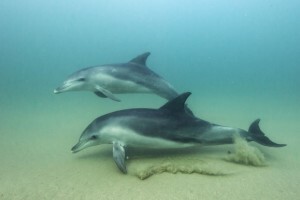 If you can get into the water quickly enough to witness a bait ball (they don’t usually last longer than 10 minutes) you’ll see the most spectacular scene the oceans have to offer. Common dolphins herd the fish into the swirling orbs by using a variety of techniques including ‘bubble-nets’. 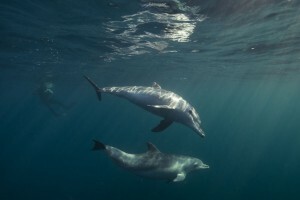 Bottlenose dolphins will sometimes work with common dolphins to corral the sardines. 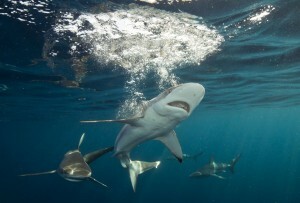 Many species of shark will take advantage of this buffet and you can see copper sharks, dusky sharks, blacktip sharks, bull sharks and tiger sharks. However, perhaps the most dramatic feeders are the whales that lunge through the bait balls with wide-open mouths. You can see Bryde’s whales, humpbacks and minke whales along this coastline. In fact about 17,000 humpbacks migrate from Antarctica to Mozambique (where they will give birth) during the Sardine Run so it’s affectionately called ‘The Humpback Highway’; you’d be very unlucky not to see at least one. an indictor species for the boats searching for bait balls. 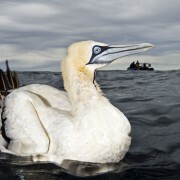 When you see a cloud of gannets, you know they are about to start their aerial assault. The boats will rush to join them and everyone will throw themselves overboard hoping to catch a glimpse of the fish before they are all eaten. The locals call this activity ‘ganneting’. 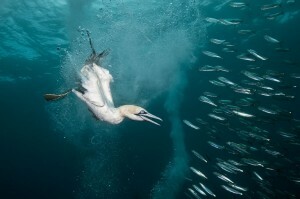 These birds make the Sardine Run thrilling from above and below the water. 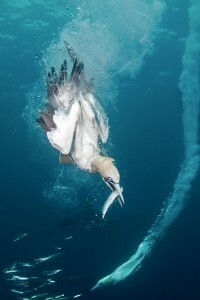 They hit the ocean at 120kph to dive deep enough to feast on the fish. One thing to note is that the Sardine Run isn’t always of the same magnitude each year. There are various theories as to why this is. Water temperature might be a factor as it’s believed that unless the water drops below 22°C the migration will not take place. With rising global sea temperatures, does this mean that this phenomenal event might be lost for future generations to enjoy? And, more importantly, how will this affect the predators? There are various locations along the Eastern Cape where you can experience the Sardine Run. I travelled to Port St. Johns in July (their winter) with Animal Ocean. This coast is called ‘The Wild Coast’ for a reason so be prepared for rough seas. 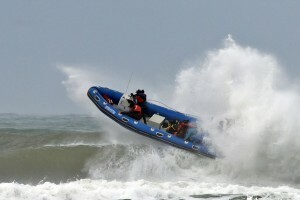 You’ll be in an open RIB boat so wind and waterproof clothing is essential. As the bait balls dissipate quickly, there isn’t normally time to put on SCUBA equipment so you’ll mostly be snorkelling and free-diving.